Pastor just finished reading the book "Hatred's Kingdom" by Dore Gold. It's about the founded religion, "Wahhabi," pronounced <wa-hab>. This religion was founded by Muhammad Ibm Abd al-Wahab (1703-1791). 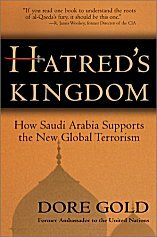 By 1811, the Wahhabi followers ruled all of Saudi Arabia and were a threat to the entire world. Later, they were defeated by Muhammad Ali (not the boxer). However, Wahhabi regained power 20 years later and held it for several decades only to lose it again by way of the British. They regained power for a third time when Ibn Saud captured Riyadh in 1902. Saudi Arabia and Wahhabi have been closely tied together ever since. "9/11" was not the first time they have done that horrible evil--it has been a lifestyle for over 200 years. They are a frightening group of people. They will use whatever weapons that they can get their hands on to destroy all people not in accordance with their beliefs. They kill their own people as fast as they would kill us. But as evil as they are, we are to live with no fear. Psalm 23:6: Says David, "Surely goodness and mercy shall follow me all the days of my life: and I will dwell in the house of the Lord for ever." Why did David want to be with other believers (in God's temple) at his most troubling time? Philippians 4:8: Paul reinforces the fact we are to "think on" (meditate) and gaze upon those things: "true", "honest", "just", "pure" and "lovely"
ILLUSTRATION: In the years Israel's king Saul sought to kill David, it was David whom was given the opportunity to kill the enemy--the king (1 Samuel 24:3). But not only did David not take that opportunity, he honored and obeyed the king because Israel's kings are appointed by God (1 Samuel 24:6). This is an example of God protecting and raising an obedient follower of Him above his enemies--no matter their strength or rank. In times of danger and pressure, how confident are you in God? Psalm 27:1: "The Lord is my light and my salvation; whom shall I fear? the Lord is the strength of my life; of whom shall I be afraid?" Times of war (or any time of tragedy--even those personal to you) are not times of fear for believers. It is exactly the time to stay prioritized with God first in your life: worshipping with fellow believers in church, "seeing" the beauty of the Lord, reflecting on His greatness with others and knowing we are protected by His grace, worshipping with joy and song. No fear--we know the true and living God!